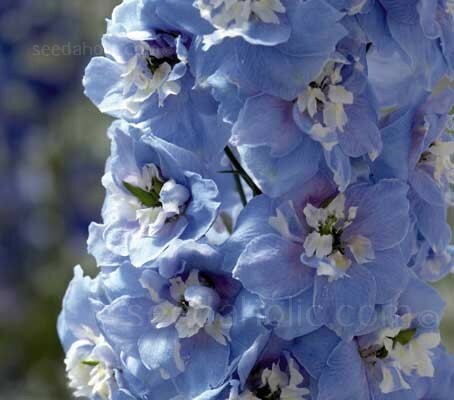 Delphinium 'Magic Fountains' is a delightful delphinium - every bit as breathtaking as their bigger cousins, but of a smaller stature - ideal for where space is at a premium. 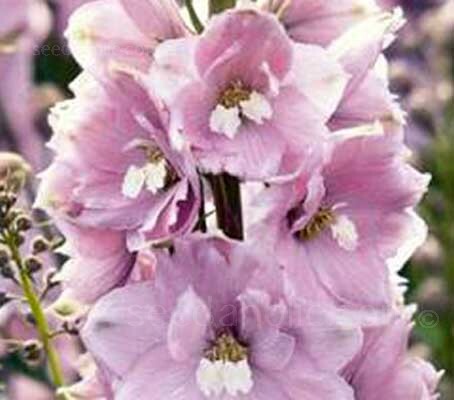 This dwarf hybrid Delphinium, grows to a height of around 75 to 90cm (2½ to 3ft) and is one of the shortest varieties available. The plants have a good compact habit with dark green deeply toothed leaves and because of its short stature and healthy thick stems, does not require staking. 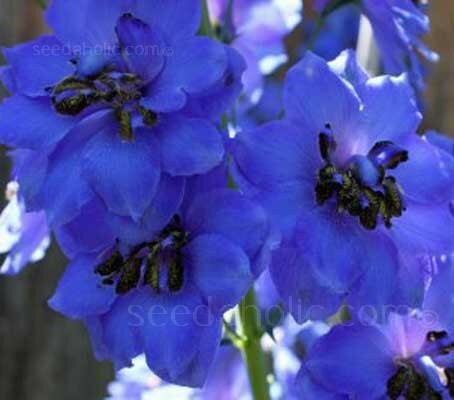 The Magic Fountains series was developed to produce the widest range of colours available in a dwarf ‘Pacific’ type delphinium. It is a vigorous-growing strain that is more heat tolerant and less fussy than most other varieties and if sown early will flower in the current year. Blooming is consistent throughout the summer from June to September, the sturdy flower spikes are very attractive to bees and make a wonderful cut flower. Sowing: Sow seeds in January to May or sow in September to October. January to May is the best time for sowing, the early you sow the better chance of planting out in summer. Use a clean tray or pot with a good quality peat based seed compost. Lightly firm the compost. Scatter the seed lightly on the surface. Cover the seed with a thin layer of vermiculite. Water in lightly. Keep in a place with a temperature of 15 to 18°C (60 to 70°F), a propagator with bottom heat is ideal. Alternatively cover the pot with a plastic bag and turn the bag inside out every 3 days to prevent excessive condensation. Place on the windowsill out of direct sunlight. Keep on the dry side and seed should germinate after 15 to 21 days. Remove from the propagator or plastic bag once germination has occurred. When seeds are big enough to handle, generally around four weeks after sowing, transplant into a small cell tray with a peat based compost. Water carefully. Once big enough pot into a 9cm (4in) pot with a peat based compost. Liquid feed as required. Harden off and plant out from May until July. If you have sown your seed late then grow your plant on in pots until it goes into winter dormancy. Keep dry and frost free in a garage, greenhouse or a porch over winter. Once green shoots appear water your plant and keep in a well lit, frost free area ready for planting out in May. Before planting out your young plant choose a site which is not waterlogged during the winter, sheltered from strong winds and which receives plenty of sunshine. Water your plant well and soak the rootball in a bucket of water. Prepare the ground thoroughly by incorporating organic matter or compost as delphiniums enjoy rich soils. Small plants are best planted in the summer months. 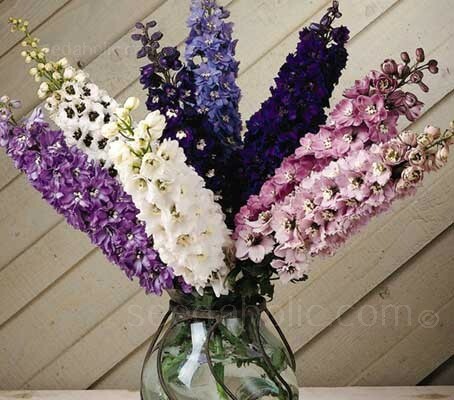 Give your plant plenty of space as a fully mature plant will easily fill a 60 to 90cm (24 to 36in) space and delphiniums are best not crowded in the border. Plant at the correct depth so that the compost is level with soil. Firm the plant in securely so that the roots can establish quickly. Water in well and try not water the leaves if possible. Delphiniums grow in most soils but need plenty of food and moisture to perform well so make sure you water regularly until the plant is established and feed this plant heavily, every season. Stake plants when planting. Do not leave it for another day. That is not an option. The gardener that ignores this step will be heartbroken. 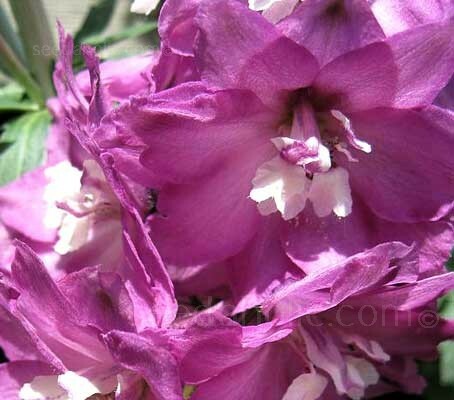 The stems of the Delphinium will be broken, as well. Staking is necessary on a windy site and with larger varieties. It is best to start when plants are still small and use a square or triangle of 120cm (4ft) canes close to the plant and tied together with twine. Place the canes 30cm (1ft) in the ground taking care not to damage the crown or the roots of the plant. This allows the spikes some movement. Twigs can also be used successfully and are less obtrusive. Start tying the plant at about 15cm (6in) with the final tie just below the florets. Tie firmly but not too tightly and always allow the plant some movement so that spikes do not snap in the wind. Delphiniums usually flower May to July but young plants often have their first flowering in late summer after their roots have established. After flowering, if seeds are not required, cut the spike down to the level of the foliage. This stops the plant setting seed and directs its energy to the roots. In later years the fewer the spikes the better the flowers will be. The plants look their best by the second year and needs dividing by year three to assure propagation. Protect from slugs and snails at all times. Once the foliage has died back in the autumn stems can be cut down to ground level and all staking removed. On wet soils particularly slugs and snails will over winter near plants and eat the fresh shoots as they appear. These must be controlled with slug pellets or a range of other methods. New growth should appear in spring and as soon as this appears plants can be fed with a good balanced compound fertiliser such as blood fish and bone meal. Mildew (a grey mould on the foliage or flowers) can cause concern in humid weather when plants dry out. To guard against this you can make sure your plant does not get too dry and spray with a fungicide early in the season, as per manufacturer’s instructions. Cottage/Informal Garden, Cut Flowers and Flower Arranging, Flowers Borders and Beds, Prairie Planting, Wildflower Gardens or Wildlife Gardens. 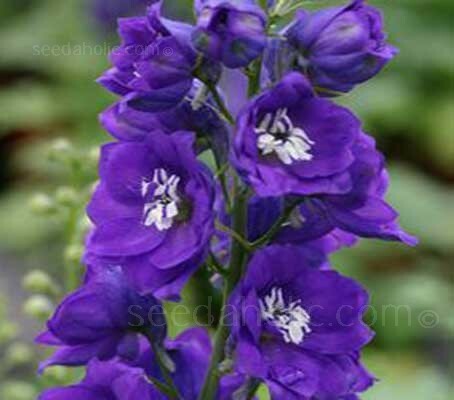 NB All parts of delphinium are poisonous and may cause discomfort if eaten and the foliage can irritate the skin. The Delphinium is a member of the Ranuculaceae family which contains almost 300 species of annual, biennial or perennial delphiniums. The plants are native to the Northern Hemisphere and some high mountainous regions of tropical Africa and are grown for their spikes or racemes of cup shaped flowers. Today's Delphiniums are mostly hybrids developed from the early 1800's from the species Delphinium elatum, Delphinium grandiflorum, Delphinium exaltatum, and Delphinium formosum. Delphinium is taken from the the Greek word delphinion, derived from delphinos or delphis for "dolphin" thought to be so named because of the similarity of the opening flower to the sea mammal. In Tudor England some of the species grown were referred to as Larkspur and occasionally Lark's Heel (from Shakespeare), Lark's Claw, and Knight's Spur, apparently because the nectar sepal looked somewhat akin to a lark's claw. The common name Larkspur also applies to a similar looking but different plant called Consolida ajacis. 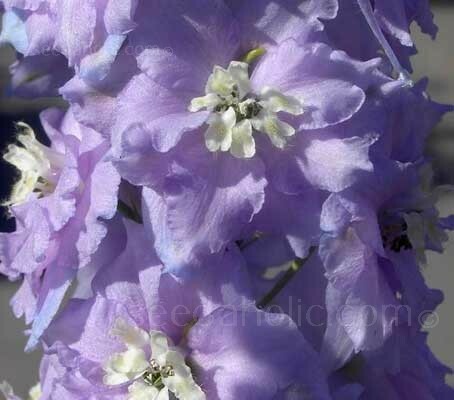 Delphinium x cultorum was formerly known as Delphinium elatum, the species name 'elatium' means 'taller, loftier or more exalted' while 'cultorum' means 'of gardens' or ‘cultivated’. 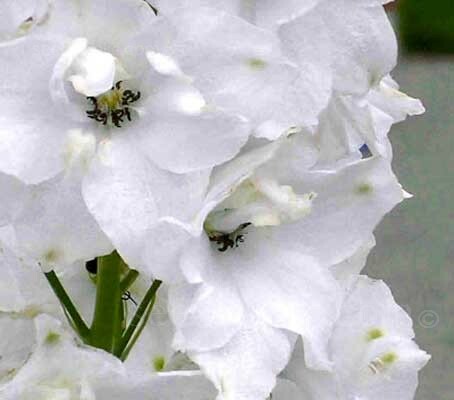 It is commonly known as the Candle Delphinium because of the shape of the blooms, or the Bee Delphinium, as many flowers have white or black centers known as "bees." Large, semi-double blooms in a range of colours. Full sun preferred although they will grow in part shade.